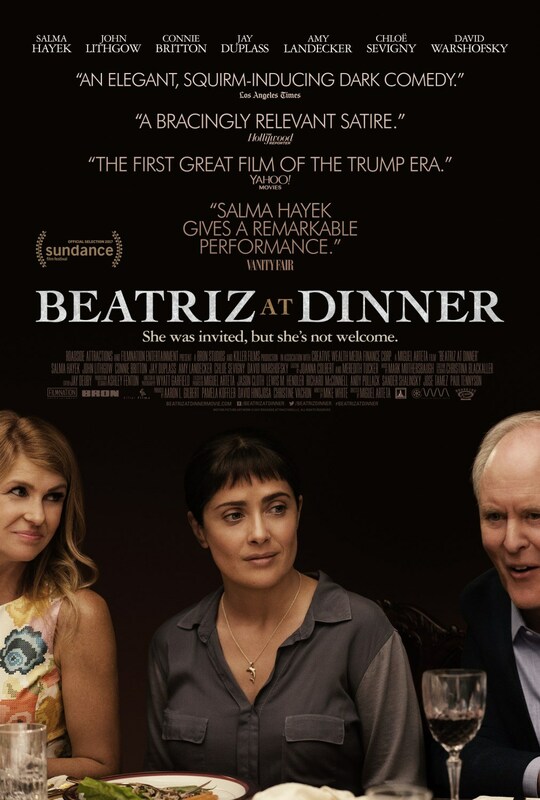 The trick to Beatriz at Dinner is how it plays its audience. In a masterful and layered performance, Salma Hayek plays the title character in a way which puts you off. She is the centre of the film, yet the audience is made to feel uncomfortable with her. The film doesn't use any of the devices films usually use to connect you to their protagonists and instead uses many of those conventions to align the audience with the film's "villains." This puts us in a difficult and awkward place while watching the film. It would have been easy to situation her are the endearing heroine, standing smugly against the elites. We could have cheered her bravery and mourned her tragedy, self-righteously, leaving feeling affirmed in our liberal goodness. But Beatriz at Dinner doesn't go there. In her refusal to accept social norms Beatriz makes us squirmy. Although she exhibits qualities we are all supposed to admire (honesty, sincerity, compassion) it is these very things that turn us off. The film is masterful for exposing the hypocrisies of western class-ism. John Lithgow is great as the man we are supposed to hate but remains charming. It is a great example of how we excuse evil when it comes in an approachable package. And it all adds up to one uncomfortable evening making us question a lot about who we are and who we think we are. 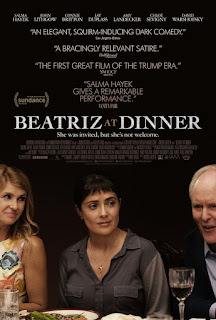 Writer Mike White is excellent at making audiences squirm and Beatriz at Dinner is a mature and thoughtful piece with him at his best.